Safe at last, Harold stumbles over a parapet wall into the arms of his fiance Mildred Davis, capping his hair-raising climb up the 13 story “Bolton Building” in Safety Last! 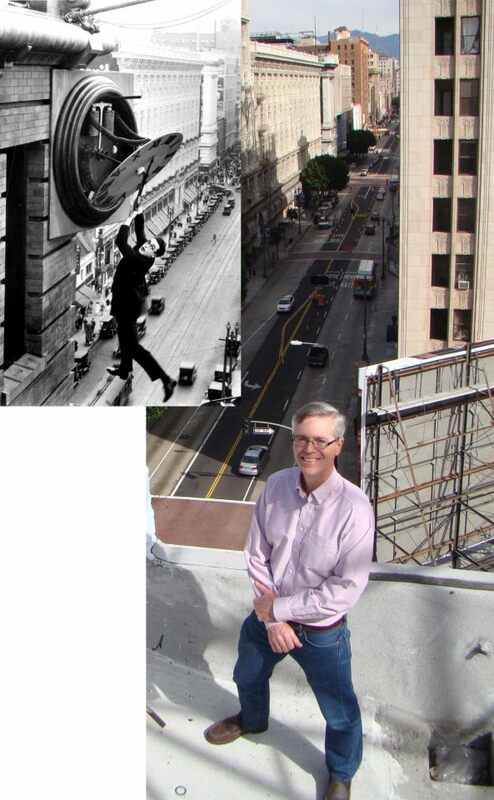 Seeking the perfect angle for each shot, Lloyd staged this brief scene atop three different buildings. Prior posts show how Harold staged the climb, and other posts reveal the Hollywood locations appearing early in the film. There is also a downtown walking tour. As the sequence begins below, Harold stumbles over the parapet from the ledge of the third and highest stunt climbing set, built for the movie atop the Merchants National Bank Building at 548 S. Spring Street. Notice the “EXAND” sign appearing above him, part of the signage for the extant Alexandria Hotel building up the street. The vertical arrow of the weather vane below cuts across the dome of the Million Dollar Theater discussed further below. Due to the remarkable Blu-ray image quality of the new Criterion Collection release of Safety Last!, during this scene we can read the signage for the Washington Building up the street, the site of the next shot, below. The extant Million Dollar Theater at back. (c) 2012 Microsoft Corporation, Pictometry Bird’s Eye (c) 2010 Pictometry International Corp. The scene continues with Harold stumbling over the parapet wall, and Mildred helping him to his feet. 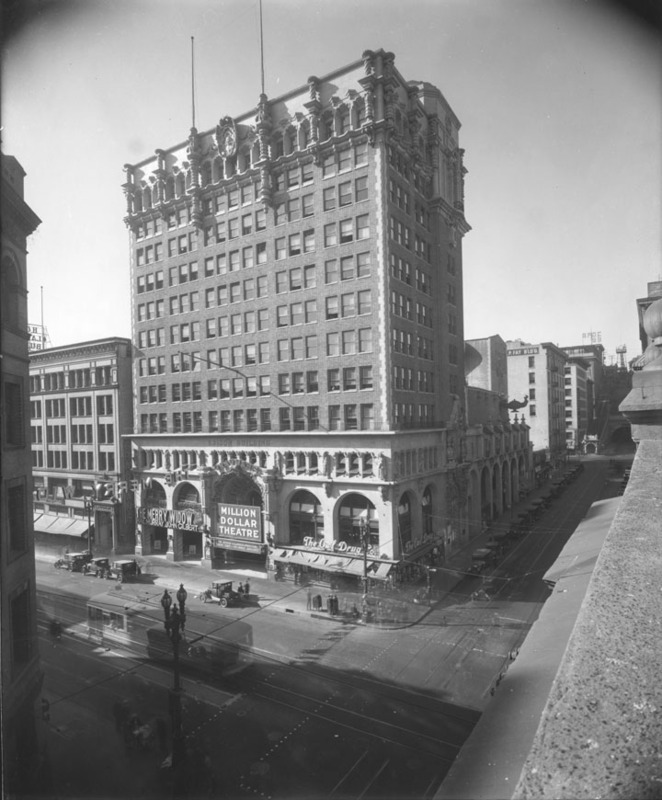 This was filmed atop the Washington Building mentioned above, at the NW corner of 3rd and Spring (arrow in modern view). Behind them stands the Million Dollar Theater built in 1917 by Sid Grauman, who would later build his famous Egyptian (1922) and Chinese (1927) theaters in Hollywood. The theater’s distinctive dome tower (box) has been a downtown landmark for over 95 years. The five-story Bradbury Building (oval) lies behind them out of view. Notice the Bradbury’s large glass atrium roof. 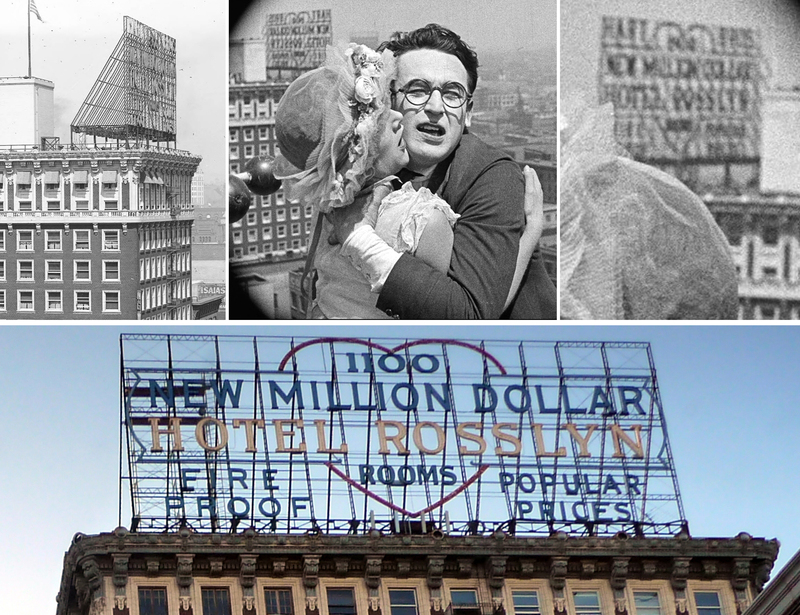 For their climatic kiss, Harold and Mildred return to 908 S. Broadway, the same building where Lloyd had previously staged the sequence hanging from the hands of the clock. This setting is readily confirmed by the distinctive wall signs appearing in the background, including the extant sign for J. EPSTEIN LADIES TAILOR on the wall of 820 S. Broadway. Harold and Mildred were married in real life on February 10, 1923, a few weeks before the movie’s April 1, 1923 premiere. The final shot from the movie (below) showing Harold and Mildred walking off into the sunset was also filmed on the roof of 908 S. Broadway. The matching contemporary image is from the 2013 Locations and Effects documentary Academy-Award winning visual effects supervisor Craig Barron and I prepared as a supplement to the Criterion release. The view in each image looks to the Blackstone Department Store Building across the street. Click to enlarge. The final scene from Safety Last!, with Craig Barron, center, and the author at right, as they appear in the Locations and Effects documentary included with the Criterion release. The author at 908 S. Broadway. Based on the geometry of the publicity photographs and movie scenes, Lloyd must have built the clock-facade set on the roof of the small structure facing Harold in the above shot, the same small structure behind Craig’s right hand. As part of the new Criterion documentary, Craig has prepared an amazing 3D simulation revealing how the clock stunt effect was created. For an extra measure of authenticity, Craig, Harold Lloyd’s granddaughter Suzanne Lloyd, and I each filmed our interviews for the Criterion release in the basement of 908 S. Broadway, the building where Harold’s most famous scenes were filmed. It was an honor, and great fun, working on the program, and I hope you will check it out. A portion of the program appears below. HAROLD LLOYD images and the names of Mr. Lloyd’s films are all trademarks and/or service marks of Harold Lloyd Entertainment Inc. Images and movie frame images reproduced courtesy of The Harold Lloyd Trust and Harold Lloyd Entertainment Inc. Locations and Effects (C) 2013 The Criterion Collection. 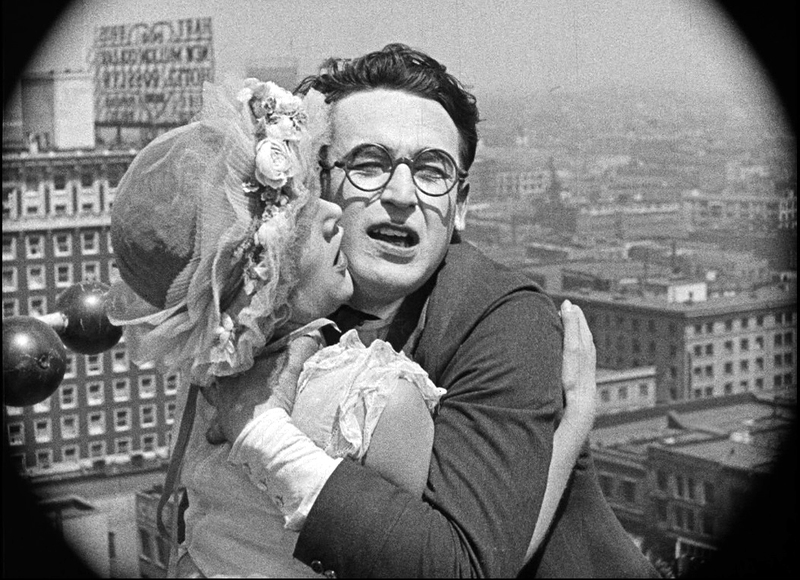 To learn more about how Harold Lloyd filmed Safety Last! be sure to check out my other posts, and my book Silent Visions. 908 S. Broadway is now home to fashion jewelry designer Tarina Tarantino’s Sparkle Factory. Tarina and her husband Alfonso Campos were so gracious to allow us to film there. The map below identifies the three extant buildings in this post from which Harold filmed scenes for Safety Last! D marks the spot of the former triangular two-story Los Angeles Investment Co. Building near Broadway and Olympic, where Lloyd built the first (and lowest) of three rooftop stunt climbing sets. This entry was posted in Harold Lloyd, Lloyd Thrill Pictures, Los Angeles Historic Core, Safety Last! and tagged Hanging from a clock, Harold Lloyd, Hollywood, How Harold Lloyd filmed Safety Last, How Harold Lloyd filmed the clock, Lloyd Studio, Lloyd Thrill Pictures, Los Angeles Historic Core, Man on the Clock, Safety Last!, Silent Comedians, Silent Comedies, Silent Movie Locations, Silent Movies, Stunt Climbing, then and now. Bookmark the permalink. Something you may / may not know – Lloyd proposed To Mildred just following the final scene on top of building 908s Broadway after losing his shoes + socks – the crew pretended to keep on filming while he got down on one knee – Mildred wasn’t sure whether He was serious or not until he produced the ring (which he’d been carrying the whole time they’d been filming!) Harold wasn’t sure she’d say yes, but she did! The whole crew found the entire event quite amusing (as Harold had already told them what he was planning previous to filming). Also Harold’s garden home served as a replica to many ancient Roman, Greek and Egyptian places of personal interest, and was not just simply an extravagant indulgence; but served a personal and practical purpose Mildred alone was privy to. Just invaluable, Mr. Bengston. Thank you very much for all that you do.